Who Took Orestes from Argos? In each of the three versions of the return of Orestes in Greek tragedy, Orestes comes back from Phocis where he was taken as a baby, reunites with his sister Electra and kills his mother Clytemnestra. 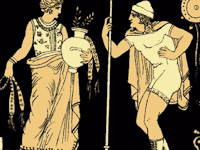 Aeschylus, Sophocles and Euripides give differing accounts of who took him away. In Aeschylus' Libation Bearers, Clytemnestra says that she sent him away to trusted friends (913). Orestes' nurse, Cilissa, says that she took care of him as a baby, but does not mention how he was taken from her or where he went. When Orestes returns to Mycenae disguised as a Daulian, he tells Clytemnestra that he was sent by a stranger – a Phocian named Strophius – to tell Orestes' parents that Orestes is dead. He makes a point of saying that he did not know the stranger, nor did the stranger know him. Right before he kills Clytemnestra, Orestes accuses her of throwing him away. She denies it, telling him that she sent him away "to trusted friends", though she does not name them. The trusted friend is most likely Strophius because it makes no sense for Orestes to name him unless he knows that Clytemnestra gave the baby to Strophius. He makes such a point about their being strangers to avoid questions that may lead to his identification. The tutor tells Orestes that he took him from the hands of his sister in order to save him. In conversation with Chrysothemis, Electra says that Clytemnestra accuses her (Electra) of stealing Orestes from her mother's hands. Later on, thinking that she is holding the ashes of her brother in her hands, Electra recalls the day she stole him in order to save him from being murdered. Orestes went from the hands of his murderous mother, to the hands of Electra, who put him into the hands of the tutor. For a few moments, Electra thinks that Orestes had arrived back into her hands in the form of an urn full of ashes. Strophius is mentioned once in the Electra. Orestes tells the tutor to pretend that they were sent by the Phocian Phanotheus, who is Clytemnestra and Aegisthus' best friend. When the tutor presents himself to Clytemnestra he tells her that he was sent by Phanotheus, but when Orestes arrives disguised as a Phocian, he tells Electra that he was sent by 'Old Strophius'. In Euripides' Electra (17) the farmer says that Agamemnon's 'ancient servant' took him away to prevent Aegisthus from killing him. The farmer says that the servant gave him to Strophius to bring up in the land of Phocis. When Electra talks with Orestes, who is still pretending to be a stranger, they agree that there is only one person who might recognize him - the old servant of Agamemnon. When the old servant visits Electra, he mentions a cloth woven by Electra that he wrapped Orestes in to save him from death. When Electra introduces the servant to Orestes, she affirms that this is the servant who saved Orestes from death.